CONDITION REPORT: The metallic grey dial has aged naturally with spotting on the dial, typically found not these metallic dials. All visible marks on the dial are result of natural aging and not damage. The tritium luminous material on the dial and hands are intact and have patinated to a nice cream color. The case appears unpolished. The crown is unsigned and likely replaced during service. NOTES: The Aquastar Deepstar is sought after by diving watch collectors who maintain it was was of the favorites of Jacques Cousteau and the Calypso crew. 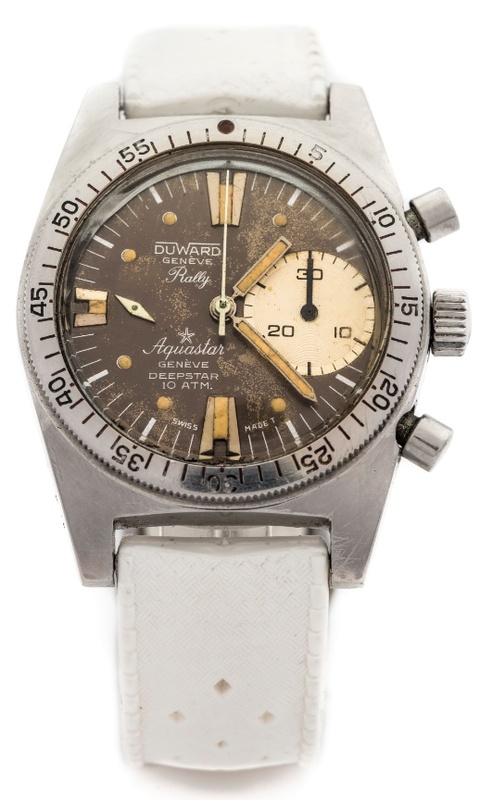 Duward was the importer for spain of Aquastar watches and had double signed dials for their watches much like Lorenz did also.